“Energy Darwinism” report finds that dramatic changes in energy favor distributed power. If you're getting the sense that the world of energy is in for some dramatic changes, the number crunchers have some data to back up your hunch. Three recent reports released in the last week spell out how the economics of the electric power business have changed over the past few years, arguing that technology will accelerate the trend toward distributed power generation. Investment bank Citi published a broad analysis of the world’s energy markets called Energy Darwinism that predicts that 71 percent of the money invested in power generation between now and 2035 will be in renewables or nuclear. More than 40 percent of that sum, which represents more than $4 trillion, will go to wind and solar, Citi’s energy economists concluded. Solar, in particular, has shown an “alarming” learning rate where every doubling of production capacity results in a 30 percent price decline for panels. At 7.4 percent, wind’s learning rate is slower, but the technology has become cost-competitive with natural gas plants in some locations. 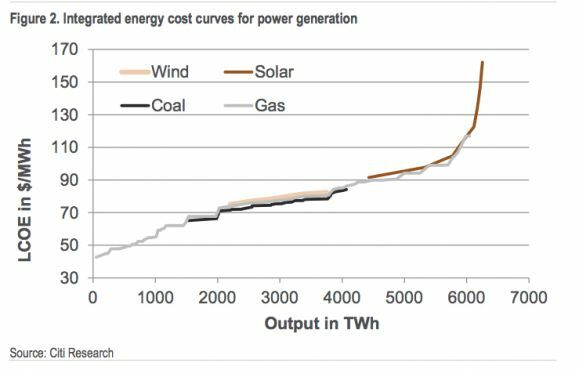 Based on these cost reduction curves, Citi’s economists forecasted when utility-scale wind and distributed solar will cost the same as conventional fuels. Digging into the effect on wholesale energy markets, Citi also forecasted exactly where “fuel substitution will take place” -- or in what circumstances it’s more economic to use one power source over another. It plots the levelized cost of energy against the output in terawatt-hours to forecast how wind, coal, natural gas and solar compete. In some cases, solar is actually displacing natural gas at peak times of the day, when power is most expensive. 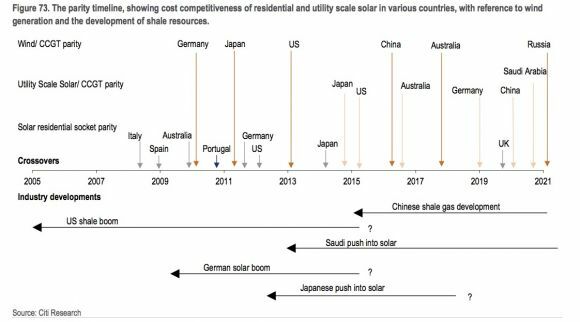 In Germany, some natural gas peaker plants are being run for less than ten days a year because of solar, the study noted. “The energy market has changed dramatically in recent years and we believe this mix is only going to alter more rapidly going forward,” concluded Citi researchers. The implications for utilities are profound. This is particularly true in developed countries, where energy efficiency could reduce utility demand by 20 percent in both gas and electricity in the years ahead. “The very nature of developed market utilities is likely to change, and companies face a choice of involving themselves within this new energy framework, or gradually regressing to come effectively state-funded, rate of return asset-based businesses,” the authors concluded. Consultants at PwC also released a report on distributed generation and its impact on the power industry. Based on a survey of professionals around the world, the report found that a majority of utilities expect distributed generation to force broad changes to the business models of power companies. “Many respondents [to PwC’s survey] believe that the tipping point to being market-driven is within reach. If that proves to be the case, it will have a big impact on companies worldwide,” wrote Norbert Schwieters, the Global Power & Utilities leader at PwC. A number of regulations need to be changed, such as capacity schemes for providing standby generation for wind and solar, he concluded. Finally, last week GTM Research released its Grid Edge report, which sketches out how utilities and energy service providers can adapt to the evolving landscape. The three reports approach these changes differently, but they all underscore one basic conclusion: the amount of change in the energy industry has happened much faster than most would have expected only five years ago. Utilities must adapt or eventually get taken over by this rapid evolution. 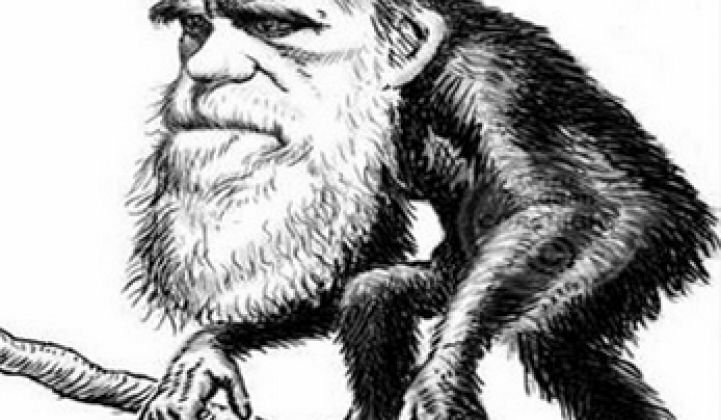 And that's a conclusion Charles Darwin could get behind.